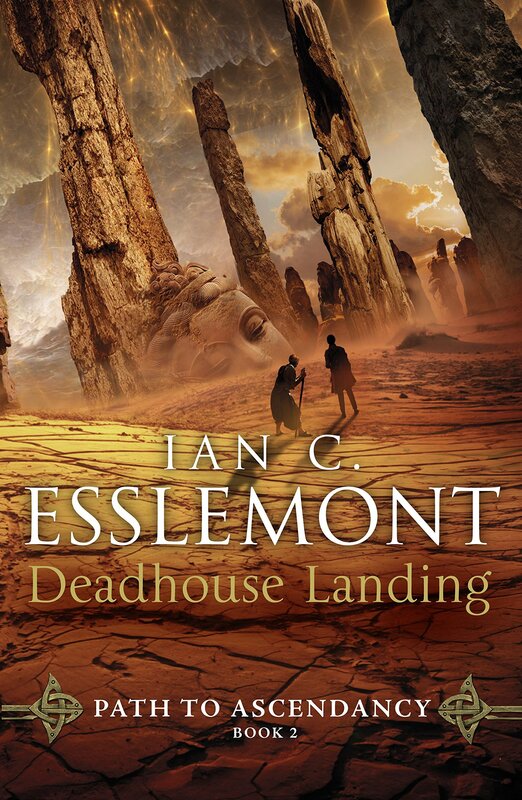 If you liked Dancer’s Lament then you will love Deadhouse Landing. Featuring the same story-focused narrative, albeit delivered with broader brushstrokes, Esslemont delivers another engrossing tale of the early steps in Kellanved and Dancer’s ascent to legend and godhood. Once again providing a fascinating glimpse at the hithertofore mysterious past of two of the more engrossing and enigmatic figures from the Malazan universe. Equally important is that knowledge of the wider Malazan meta-narrative is not necessary to enjoy the book… although it does add a lot. Deadhouse Landing picks up the story of Dancer and Kellanved shortly after their disastrous attempt to wrestle power from the Protectress of Li-Heng. Not souls to dwell on past mistakes or failures, they set their sights on a new challenge, the piratical isle of Malaz. Admittedly this ambition is perhaps more to do with happenstance than an outright plan per se, but when has a plan ever survived contact with reality? Especially when these two are involved. So when faced with a small pirate kingdom, rising tensions with the neighbouring sea power Nap, and, let’s face it, Kellanved’s individual approach to reality, Dancer has his work cut out trying to fend off knives in the back, cutlasses in the side, and monstrous teeth in the shadows. Better than Batman versus Superman Dawn of Justice… but that isn’t saying much. A looong film filled to the brim with action and fight sequences. Despite this there are moments of real humour and pathos, and it touches on some important and interesting themes. All in all a good action movie in the Marvel franchise. One of my biggest complaints about the Marvel, and now the DC, movies is that they spend a lot of time setting up the next film in the franchise, rather than focusing on the film in front of them. Basically, they are so obsessed with the big picture that they lose sight of the current story at hand. While there was a little bit of that in this film (ok more than a little bit), it thankfully felt a lot more focussed on the story being told and wasn’t just adding elements to foreground the next step. What was even better was that because the characters had been introduced and explored in previous films much of the story focussed on what was happening, rather than trying to shoehorn in more backstory and character history. It did feel a lot like an Avenger’s film rather than a Captain America story, with the majority of the film falling on Chris Evan’s and Robert Downey Jr.’s shoulders. But I have to admit that they handled the large ensemble cast pretty well, and although it was stuffed to the gills with characters and fights, there was a real story hiding in there behind the heavy-handed moral lessons, the biased narrative focus, and the occasional plot hole. If you liked Forge of Darkness then you will like Fall of Light. Same Shakespearean style and tone, although this time there are more elements of comic relief and respites from the darkness. The civil war continues, the factions become more delineated and yet messier, and the War on Death gets some more attention. What can I say? It is a book two, so it follows on from Forge. With Forge of Darkness, Steven Erikson launched into the mythic history of the Tiste and began the story about the sundering of their civilisation and the creation of the distinct races. Fall of Light continues this epic fantasy narrative by delving even deeper into the tensions that run rife in a civil war, and by exploring the various factions and how the individuals within those factions often have their own agendas. It is always easy to see the grand sweeping movements that alter societies, but part of the focus of Fall is on how individuals actually shape and alter the course of history, almost without knowing it. Some events seem inevitable, others can be changed, and the reader is in the privileged position to see how individual ambition, pride, and simple mistakes, cost the realm dear. Action packed military SF novel that is smart, well paced, and a blast to read. Coles’ characters are fascinating flawed heroes who are balancing their personal lives and ambitions with their duties as serving officers. Given the plentiful action, it is surprisingly insightful and joins the ranks of great military SF like Haldeman’s Forever War and Heinlein’s Starship Troopers. Let’s face it, when it comes to literature I am more a fantasy fan than SF. I might have studied SF, but my first love will always be fantasy. So it came as something of a surprise how much I enjoyed this book. Bennett R. Coles’ Virtues of War is one of those smart SF military fiction novels that dares to be read in two completely different ways. On the one hand you could read it as a straight-up, gung ho, military SF action story and it doesn’t disappoint. There are space battles, planet-side encounters, basically action aplenty. Or, you could read it as a critique of expansionist military regimes, that still has sympathy and empathy for the men and women who serve in the armed forces. I suppose, what I am trying to get at is that Coles breathes life into the old adage about ‘loving the soldier and hating the war’. But, as with all attempts to illustrate concepts and bring them to life, it is more complicated than that, and Virtues is all the better for it. Good, but not as great as the first season. It has more fights, explosions, and killing than Season One. It has gone more to the supernatural side of Daredevil stories and lessened the realism significantly. Still does some very clever things with theme and character, but has a more complicated narrative structure that occasionally wobbles and feels a little overfull. I loved Season One of Daredevil. I thought it was a gritty, ‘realistic’, down-to-earth superhero show that made the incredible seem plausible, did interesting things with character, and focused on telling a good story. It was thematically consistent, and, in terms of genre, kept its sights firmly on the street crime elements that gave it an authenticity and credibility. Season Two didn’t quite hit the same notes for me. Don’t get me wrong, it is still better than the vast majority of other superhero shows, but the first season was so good that this time around my expectations were perhaps a little too high. Of course you can’t really hold the show responsible for not meeting every viewer’s expectations, but when the first season creates them, you really hope that the follow up at least meets them. But there are some aspects that just didn’t work as well for me this time. Bonkers, absurd, silly, fantasy comedy, this time poking fun at dungeon crawls and the often times ridiculous politics of genre fantasy novels… amongst the other usual targets. Sharply written, but did I mention silly, absurd fun? Plus, the Subpress Edition has great artwork.